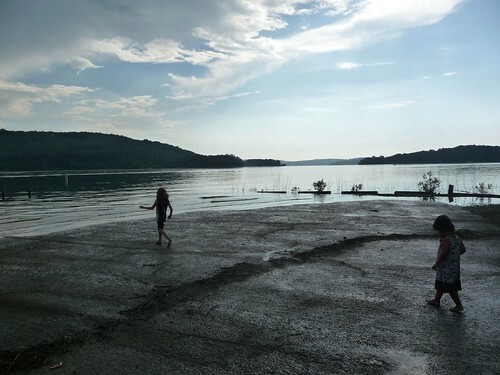 Mali Mish – Day 102: Homesteading at Tenkiller Lake, Oklahoma. 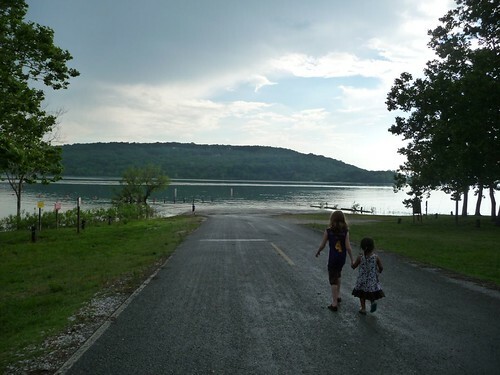 Day 102: Homesteading at Tenkiller Lake, Oklahoma. Today is a very special day. It is not only special because we are heading into Oklahoma for the first time but because it is also our 8th anniversary. If you told me on the day we got married 8 years ago that we would be full timing on the road with 2 kids today, I would probably think you are crazy. It’s amazing how much things have changed for the better since then and we are happy to be where we are today. OK, enough of the cheesy sentimental non-sense. 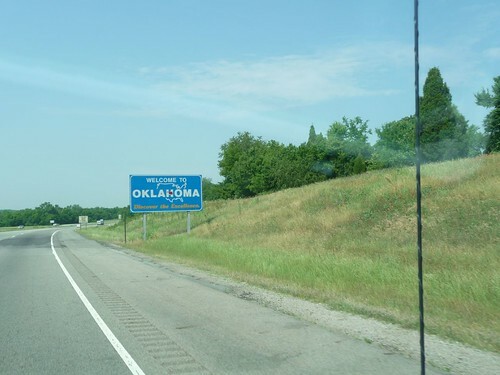 After Marlene and I exchanged cards and presents this morning in the parking lot of the Wal-Mart (how romantic), we headed into Oklahoma. Driving through Arkansas and eastern Oklahoma gives you a nice view of the Ozarks in the distance to the north. It is amazing looking and even though we will not be heading that way on this trip, we hope to be driving through there sometime in the near future. We usually tend to carry a lot of eatables while on a trip so you can see here the type of coolers we use so that you can also buy them to preserve your food on long trips. Make sure to always over pack on a trip and extras are always a good idea. 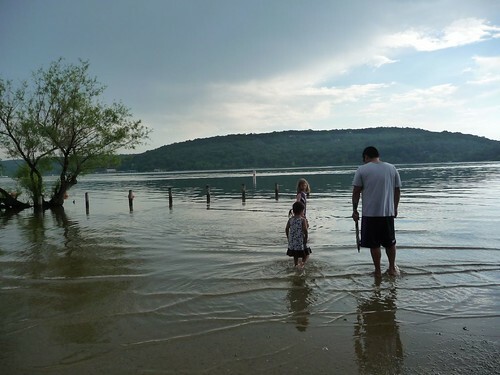 After talking with my friend Fred who now lives in Oklahoma City, he told us that instead of going to his house, he and the family have planned on going camping at the lake this weekend. Well, we are down with camping. We love it so much we have done it for more that 100 nights straight! 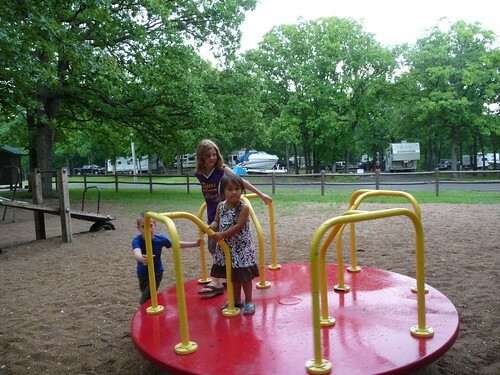 Since Memorial Day weekend was coming up, we decided to head up to the campground by the lake to secure us a few spots since it is a first-come-first serve facility. 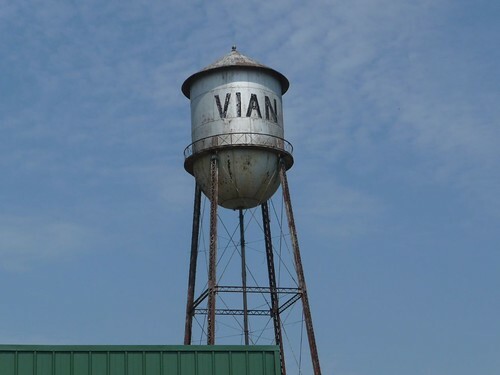 We got off of the I-40 a few miles into Oklahoma and got to the little town of Vian just off of the exit. 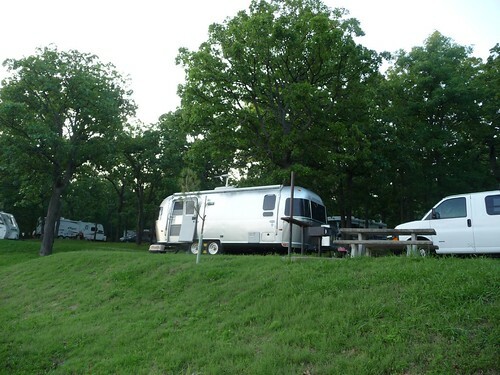 It is on the way to Tenkiller Lake just a few miles up the hill in eastern Oklahoma. Being a Wednesday morning, nothing much is open as we drove through this little town that caters mostly to weekend boater traffic. 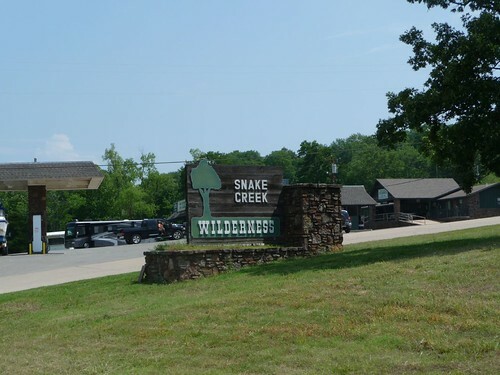 Our meeting place is at the Snake Creek Campground but Fred and company were not scheduled to arrive until later this afternoon. Since we are here first, we needed to get 3 sites next to each other if it was possible. By the time we got here, the sites were already starting to fill up. 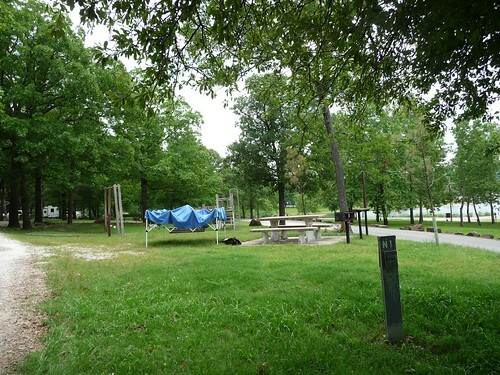 Since this weekend is 3-day weekend (Memorial Day), lots of people have showed up early in the week just to throw a tent down on empty sites in order to secure them. 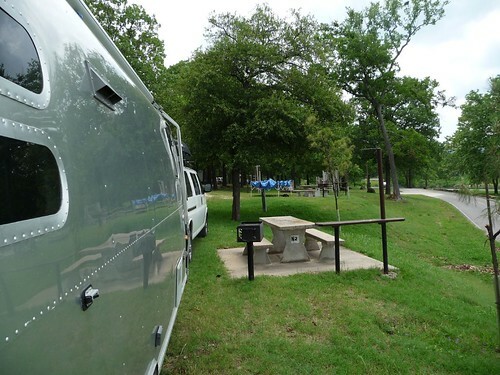 We drove around a couple of times and realized that finding 3 sites wasn’t going to be easy so I grabbed the only 2 side-by-side sites left and plopped our EZ-Up canopy on one and the Airstream on the other. As I was busy getting the tent out of the cargo box above the van, I knew only one site near us was left and I had to hurry. 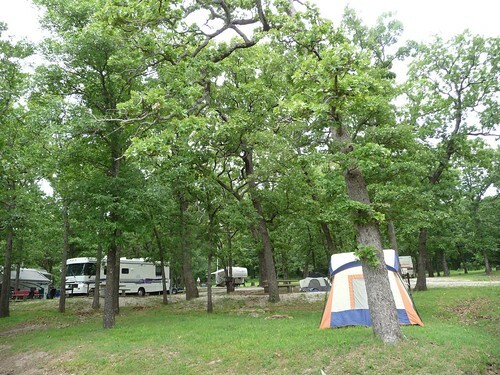 When I finally got the tent out and ready to stake claims on this piece of campground real estate, a Class A RV pulls up and into the site. Damn it. I was just a hair too slow. By this point I am carrying the tent moving on foot to find another site before they are all snatched away from right before my eyes. After running around the entire site carrying a tent in 90 degree heat and near 100% humidity, I was drenched with sweat but had luckily found the last open spot at the other side of the campground. As I walked back to the Airstream after setting up the tent, I hear someone honking up the road so I looked up. At first I didn’t what what the person was gesturing with his hand out of his RV window in my direction. Then I realized it was that same Class A RV that took my spot and was signaling at me that he was leaving and I could have the site. I got Marlene out of the Airstream and told her to stand in the site just in case someone else beats me to it again so I can huff and puff my way back across the campground to drag the already-set-up tent all the way back. I now have a real appreciation of what the homesteading sooners were going through back in the 1890s as they raced across the plains looking for a place to call home. With the sites secured we decided to go find a bite to eat. 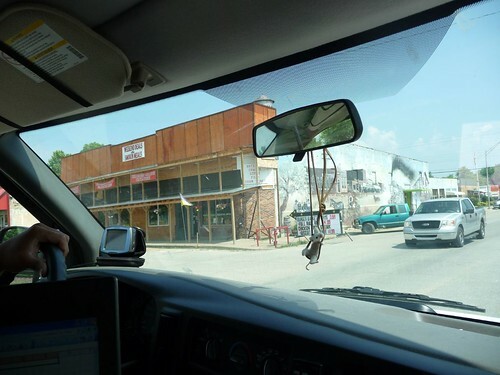 We did not see very many places on our way up here so we got in the van and headed back down to the little town of Vian where we thought we might have better luck. 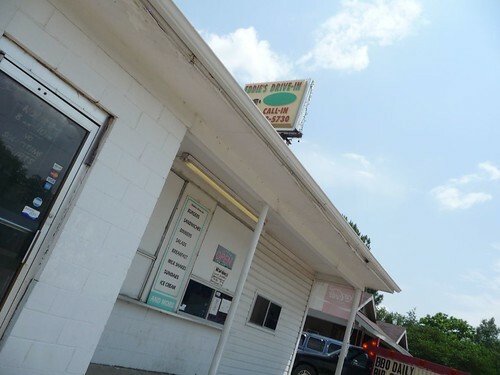 One of the only places open was this little burger joint called Eddie’s Drive-In. We were the only customers here and when we went inside, Ava saw interesting decor hanging on the walls. 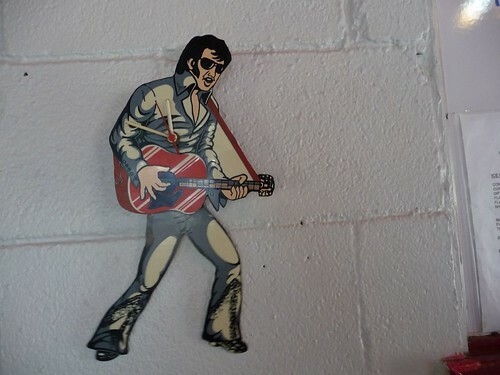 That’s right, apparently Elvis has followed us up here. Eddie is a big fan of the king and has decorated his diner accordingly. 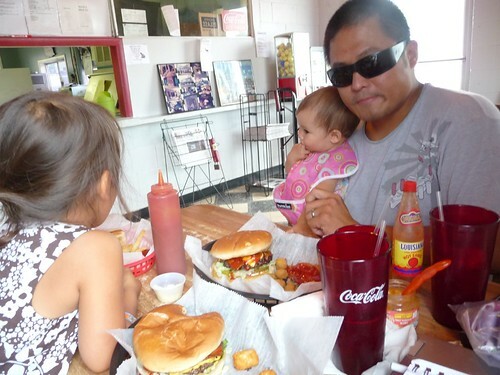 Not only does Eddie have good taste in music, his burgers were delicious as well. As we gobbled up the food, we could see the dark clouds starting to form outside. 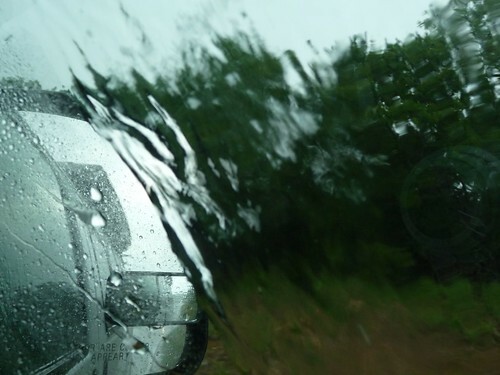 On the way back to the lake, it poured on us. In our haste to put up the tents and canopies to save out sites, we did not cover it up with the rain flies. Good thing we don’t plan on sleeping in them. Shortly after we got back, Fred and his family arrived. It’s been awhile since we’ve had other kids around and Ava was delighted to meet his 2 kids Jaiden and Cade. 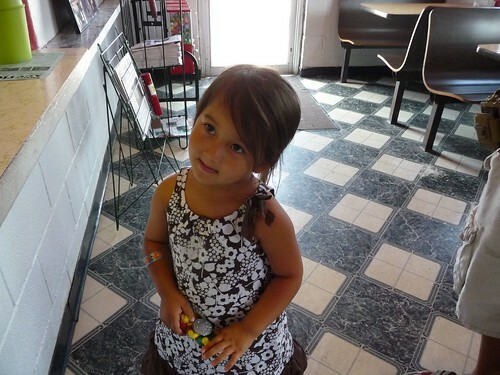 Jaiden is 8 years old and was probably Ava’s age when I last saw her. 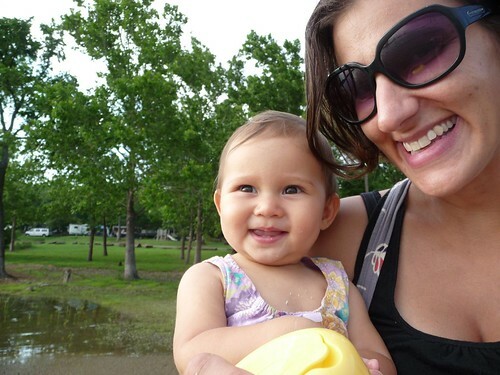 Ava loves having older kids around and luckily for her, Jaiden was excited to have another girl to play with. We decided to head down to the boat ramp to check out the water temperature. I just love the way the sky looks shortly after a flash storm. Especially when it is approaching dusk. Being a Wednesday, there were hardly any boats in the lake and the water was as clean and calm as can be. So much for that. 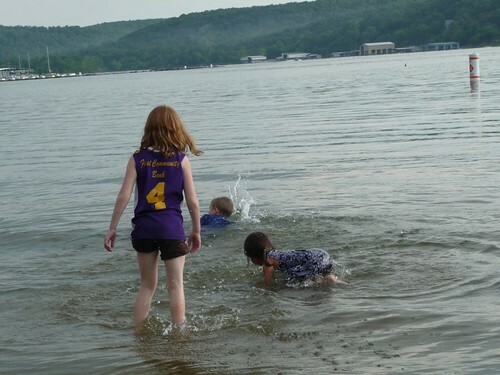 The water was nice and warm and the kids just could not resist diving into it with their street clothes. I guess we will go get the bathing suits. I think we will stay here for a few days. It is nice to do something different than just sightseeing. It’s especially nice coming to a new place to spend time with old friends. Day 103: Californian turned Okie.